For many in the Republican establishment, the ongoing flirtation with conservative grassroots over the last few years began to look a little like a walk of shame after Tuesday’s emergence of state Sens. 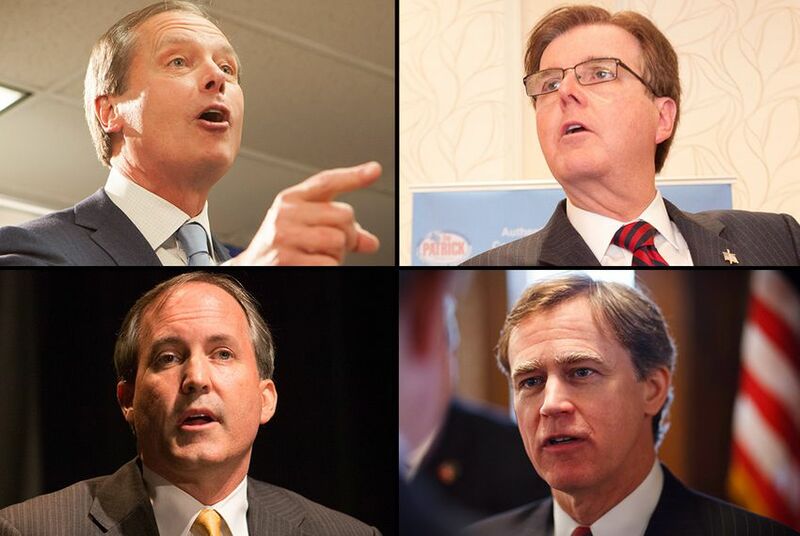 Dan Patrick and Ken Paxton as front-runners in their respective runoffs against Lt. Gov. David Dewhurst and state Rep. Dan Branch. It was one thing for Republican leaders to bat their eyelashes at the Tea Party in the service of electing Gov. Rick Perry and Dewhurst, both reliably pro-business Republicans. But the barely suppressed fear of Patrick in insider circles in Austin suggests that a relationship that started like When Harry Met Sally has gone all Fatal Attraction. That anxiety among GOP elites may be somewhat misplaced, or at least overblown. The core concern for establishment Republicans is that the Tea Party’s determination to tear down government to the studs includes limiting the delivery of services that are important to the private sector, from infrastructure to business incentives and subsidies. But a look at the attitudes of Republicans on a battery of questions we asked in the February 2014 University of Texas/Texas Tribune Poll about social and economic actions by the state and federal governments reveals that Tea Party identifiers are not cut from a different cloth than the establishment politicians they criticize as self-dealers or big-government types. Rather, they’re simply the most conservative among a bunch of conservative Texas Republicans. Generally speaking, do you support or oppose actions by the federal government on economic issues? Generally speaking, do you support or oppose actions by the federal government on social issues? Generally speaking, do you support or oppose actions by the state government on economic issues? Generally speaking, do you support or oppose actions by the state government on social issues? Not surprisingly, a majority of Texans, and a vast majority of all Republicans, opposed actions by the federal government in both the economic and the social domains. Attitudes toward state government action varied more, and shed a surprising light on what a more Tea-infused Texas government might look like. If the Tea Party were made up of libertarian leaning, anti-government zealots, we would expect a lot of opposition to government action, on economic and social issues, but that’s not the case. Overall, 70 percent of Republicans favor state government action on economic issues, while 55 percent support state actions on social issues. Among Tea Party Republicans, 56 percent support government actions on social issues (7 points higher than their non-Tea Party counterparts), and on economic issues, 73 percent of Tea Party Republicans expressed support for state action (10 points higher than non-Tea Party Republicans). Those who rally beneath the Tea Party banner appear more willing to use state government to accomplish their policy objectives than non-Tea Party Republicans. While it might be tempting to romanticize the Tea Party as something distinct from the Republican Party, independent of the traditional left-right axis that has defined politics for as long as anyone can remember, that image of the Tea Party, at least as it applies to those who embrace the label, is fantasy. This view of Tea Party attitudes may seem counterintuitive given some of their leaders’ rhetoric and actions, but it is consistent with key instances in which Tea Party legislators have sided with mainstream Republicans and social conservatives. The data suggest that Tea Party voters would, if given the opportunity, support using government power to enact unquestionably conservative policies. Through our four years of polling, Tea Party Republicans have tended to be more favorable toward the most conservative policies (most prominently, state-enforced limits on abortion) than non-Tea Party Republicans. They also tended to oppose Democratic policies the most strongly. In sum, they tended to look like very conservative Republicans – not like a distinct entity. The infusion of new leaders that would accompany Patrick’s ascension, if he wins, would likely be buttressed by a more conservative Republican coalition in the Texas Senate and bring in some new policy thrusts. But it’s not as if the 83rd Legislature was a uniformly moderate policy show. Legislators produced water and transportation bills, but they also restricted abortion access, reduced standardized tests and approved alternative educational tracks. On economic issues, fear of the Tea Party kept the dollar figures on spending proposals for water and transportation low, and it induced risk-averse legislators to send those proposals to the voters for ratification (and plausible deniability) but didn’t derail those proposals outright. Should the apparent trajectory of the primaries continue through the runoffs and the general election, the next legislative session will likely see a full magazine of open-carry gun proposals — on college campuses and elsewhere — and probably the return of a school vouchers proposal. But what it most likely won’t bring, if Tea Party attitudes are any guide, is a dismantling of government. Or, at least, it won’t be the Tea Party that makes it happen.